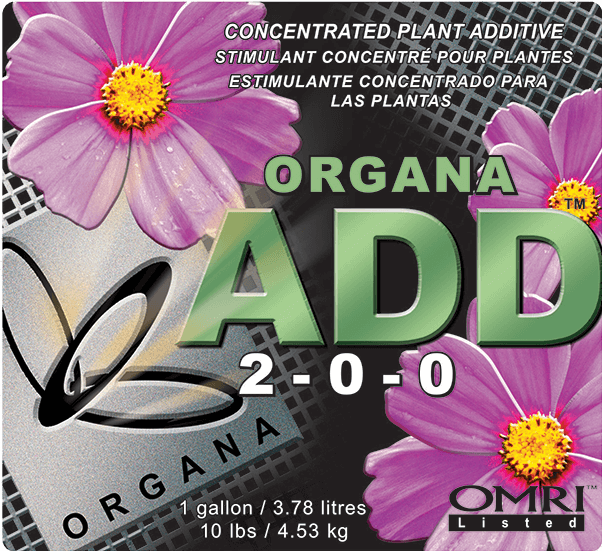 Organa Add is a certified organic, super-concentrated micronutrient supplement designed to promote more vigorous plant growth and vitality. Micronutrients are essential to healthy plants at all stages of growth and development. Organa Add is designed to be used in conjunction with a regular and existing fertilizer program. Organa Add can be used in conjunction with the full Nature’s Nectar line for a complete feeding program or as a standalone nitrogen supplement. Use at a rate of 0.25-0.5ml per litre (0.2-0.4 tsp per gallon) of water once per week or with every feeding for the entire life-cycle of the plant or as needed. Use at a rate of 1-2ml per litre (0.8-1.6 tsp per gallon) of water twice per week for the entire life-cycle of the plant or as needed. Foliar Application: Use at a rate of 1-2ml per litre (0.8-1.6tsp per gallon) of water and mist leaves once per week.